Back in March, I was asked to present a talk to Professors at Cape Breton University about finding success with Academic publishing. This was in part because of my own experience with publishing, but also in my role as Editor-in-Chief for The Canadian Entomologist. This talk took some time to put together, but it was a lot of fun to think in detail about how the publishing ‘game’ is changing, and how’s it is difficult to navigate – especially for early-career Academics. In this post, I am pleased to share my presentation with you – I hope it is useful to some, and I hope it sparks discussion about finding success in publishing. I realize some things were missed, and the presentation itself is rather static and cannot capture the dynamic discussion that was part of the seminar given at Cape Breton. In the presence of spider silk, insect herbivores eat less plant material – and the spider doesn’t have to be around to see this effect! Spiders are important in agricultural systems because they eat many insect pests that in turn eat valuable crops. 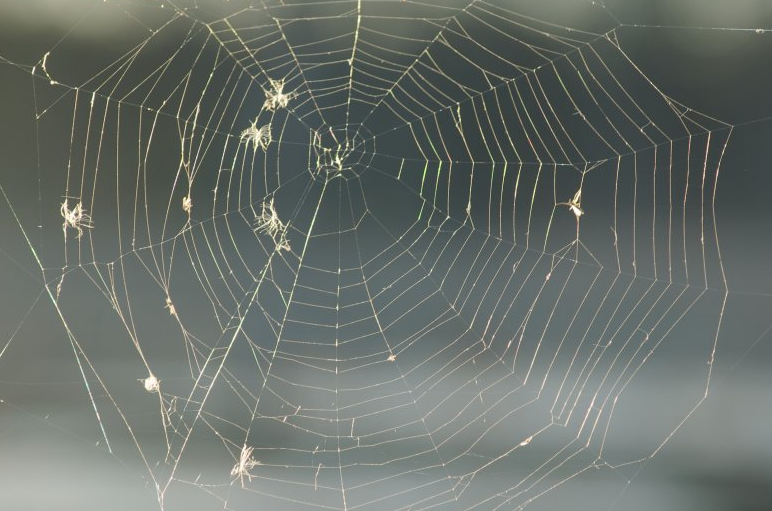 Spiders also leave behind silk as they move through an agricultural field – sometimes this silk is there because it was part of a web that was constructed to catch prey, or sometimes spiders leave silk in the form of a ‘drag-line’ – a kind of silk that acts as a safety-line for a spider. Whatever the means, the agricultural landscape contains plants, their insect pests, spiders and spider silk. In this work, we wondered whether silk, in the absence of a spider, would still cause the insect pests to be wary, and feed differently than if there was no spider silk in their environment. 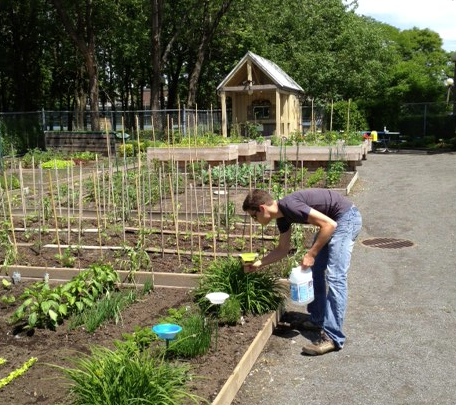 We used laboratory and field-based experiments for this research, and we used two pest species – the Japanese beetle and the Mexican bean beetle. 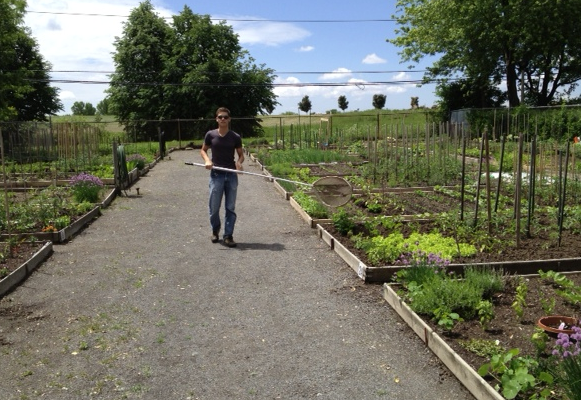 These pests were allowed to eat either leaflets or whole plants of bush-style snap beans. The plants or leaflets were either left alone, or were adorned with five strands of spider silk or with five strands of silkworm silk. We included the silkworm silk (i.e, produced from the silkworm moth) because we were curious about whether the beetles might respond to ANY silk instead of silk produced specifically by spiders. 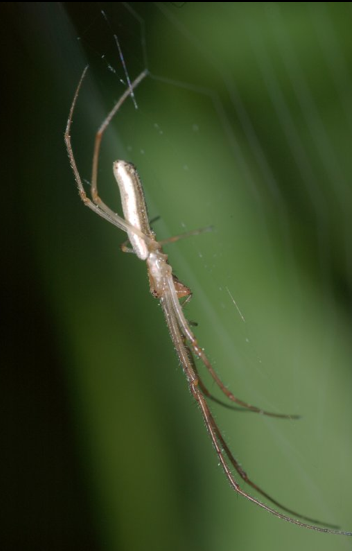 To extract the spider silk, we allowed a long-jawed orb-web spider to hang from its drag-line, and we wound its silk around a stick as the spider bobbed up and down – in this way we could get enough silk for the experiments. We found that when spider silk was on the plants, the insects inflicted less damage compared to when there was no silk. The silkworm silk also caused the insects to feed less, but the effect with silkworm silk was less than with spider silk. We also wondered whether this response could just be because the silk got in the way of the beetles, and so we did some experiments with human hair, and a strand of kevlar – these are both ‘silk-like’ strands but since they did not come from an insect or spider, would only represent the physical nature of the silk rather than have any other chemicals or smells from the silk produced by a insect or spider. This additional experiment showed us the same results: the insect pests still ate less when on plants containing silkworm silk or spider silk compared to those with the kevlar or human hair. All these experiments, combined, tell us that there is something very special about spider silk, and it causes pest insects to eat less plants. In ecology this is dubbed an ‘indirect’ effect – the spiders do not have to eat a pest insect to cause it to change its behaviour! It is also called a ‘non-consumptive effect’ – meaning the effect of the spider on its prey is not through the act of eating the prey, but rather by changing prey behaviour by other means. This work is fascinating because it shows that spiders have a much more important role in agricultural systems than we realized before: spiders do not have to be present to cause insects pests to eat less – as long as they were there, and produced silk as they moved through their environment, their potential prey will live in a ‘landscape of fear’. Or, the insect pest is living in fear of spiders because of their silk. The pest insects (the beetles) in our study system recognize the silk is coming from a potential predator (the spider), and this means they alter their behaviour, or LIVE IN FEAR! This work fits within the broader literature about the landscape of fear (e.g. see Laundré et al. 2012), or ecology of fear sensu Brown et al. (1999). The idea here is that prey are shifting their behaviours depending on predators, and so the prey’s overall ‘landscape’ is peaks and valleys related to the strength and type of interactions (direct or indirect) caused by the predator. To anthropomophize this even more: fear induces behavioural changes in prey; they are scared and this fear has real and measurable effects. Although a lot of this kind of research is with vertebrates, there are some interesting examples from the arthropod world. One recent example is by Hawlena et al. (2012) – in this work, grasshoppers that were raised in an environment of fear (via continual exposure to spiders whose chelicerae were glued shut) had different Carbon:Nitrogen ratio in their bodies relative to controls, and this affected plant litter decomposition. So, the ‘fear factor’ changed the elemental composition of grasshopper’s bodies and eventually this affected the decomposition process! In Hlivko & Rypstra’s (2003) work, a leaf-eating beetle, when exposed to a range of cues produced by spiders (this included feces, silk and other chemicals) ate less plant biomass compared to controls, and the strongest effect was from cues of the largest spider. 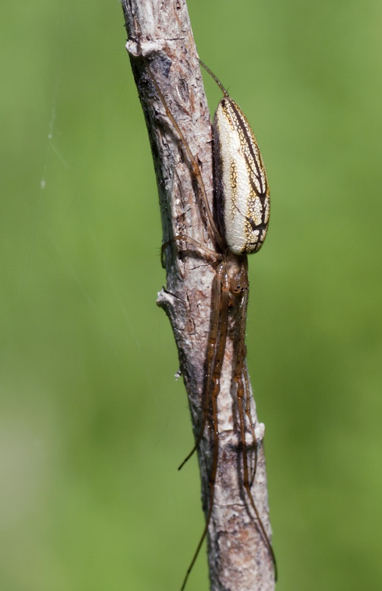 Within the context of fear – the largest (and presumably the most feared) spider, can elicit a response in its prey which results in an affect on plant biomass. Our paper is taking this one more level, and focuses on the silk as a key ‘cue’ that induces the behavioural change in the prey. Our results show that insect pests that feed on plants in agroecosystems may be living in a landscape of fear that is brought on by one of the most common substances produced our eight-legged friends…the silk. This silk acts as an important cue for the insect pests and they eat less plant material because of this. This research also shows the added value of spiders in agroecosystems; conservation of spiders, or even habitat manipulations to encourage spiders to live in agroecosystems, could have many pay-offs. Thanks to Max Larrivee and Lee Jaszlics for permission to use their wonderful photographs! 1) Scientists do really interesting things. This is a really, really big problem. Scientific research is largely funded by public money, and it can be argued that scientists have a responsibility to make their work accessible to the public (and scientists are particularly well suited for outreach activities!). The main platform for disseminating research results is the peer-reviewed journal paper and this is not ideal. Let’s be honest – these kinds of publications are often very specialized, full of jargon, and unreadable to most (even other scientists). Many papers are also behind pay-walls, making them even less accessible to people outside of certain institutions. Earlier this week I attended a scientific conference (the annual meeting of the Entomological Society of Canada) and as part of this conference I was invited to speak in a symposium that was about social media in science. It was a great session and some of my favourite social media mentors were also speaking at the symposium, including Adrian Thysse, macromite, the Bug Geek, and Biodiversity in Focus. As I was preparing that talk the week before, I was also madly finishing a grant application, and in that application I was require to write a plain-language summary of my proposed research. The granting agency uses this ‘summary for public release’ as a way to communicate research to the public. Taxpayers fund the research and they might want to know where their money is going; the granting agency has found one way to communicate this information in a clever and effective manner. Here is the proposal: Every scientific paper published in a peer-reviewed journal must be accompanied by a short, plain-language summary of the work. This summary would be placed on-line, free for everyone to read. It would be concise, clear, free of jargon, and highlight why the work was done, how it was done, and what was discovered. 1. Media: Media offices at Universities are constantly interested in promoting fantastic work by their Professors. This work, however, is often not accessible and it can be a lengthy process to put together a press release (how easy is it to track down a researcher?). A plain-language summary written by the researcher would be readable, clear, accessible, and an easy way to start the process of promoting research activities occurring at Universities. 2. Blogging: I am a regular blogger, and always happy to promote the research occurring within my laboratory, the laboratories of colleagues, or just discussing interesting scientific papers that I have read. If I had plain-language summaries to access, it would make the process that much easier, and help facilitate timely communication with the public about recently published work. Other science bloggers could also pick up on these summaries for their own writing. 3. Publishers & Editors: As an editor-in-chief for a scientific journal, I sometimes look for ways to promote great papers, and promote the journal to a larger audience. If I was able to peruse the summaries for public release, this would make the process much easier. Publishers could also take text from these summaries, put together a press release or blog post, and also promote research results from their journals based on particularly interesting papers and findings. 4. For Everyone: In my experience, people outside my area of expertise are always keen to hear about research activities. It’s sometimes a challenge for me to explain my research results, and if I was always doing plain-language summaries, this would get easier. The audience for research results can be as big as you can imagine: high school students, friends, family, colleagues, Departmental chairs, graduate students, journalists, libraries, etc… Finally, the Bug Geek has a great post about the challenges of talking science to 10-year olds: it is hard to do, but important. We need practice. These summaries will help. The procedure for getting plain language summaries could be quite simple. When an author submits the final revisions on a scientific publication, they would be required to write a short plain-language summary. I would like to think that publishers would be willing to incorporate this (simple) step into the on-line systems for manuscript processing, and be willing to post these, as open-access, on their websites, possibly paired with Abstracts. These summaries would not diminish the value of the actual peer-reviewed papers – it would probably help increase readership since these summaries would help people find the work they are actually looking for, and give them a doorway into the scientific literature. It will be an effective way to do science outreach. Please comment, share the idea, and let’s see this idea grow. Authorship on written work should never be taken lightly. Authorship implies ownership and responsibility for the ideas and content portrayed as the written word. In science, our currency is the written word, in the form of peer-reviewed articles submitted and published in scientific journals, and multi-authored works are the norm (sometimes to ridiculous degrees!). Being an author on a paper is critically important for success in academia: the number of publications on your CV can get you job interviews, scholarships, and often leads to increased research funding. Scientists are often judged by publication metrics, and although we may not like this system, it remains prevalent. With this context I pose the following question: What is the process by which an individual is granted the privilege of being an author on a peer-reviewed journal article? This blog post will provide an objective method to determine authorship for a publication, and by sharing it, I hope it helps bring some clarity to the issue. (Note: as a biologist, I am drawing from my experiences publishing in the fields of ecology and entomology, and in my role as the Editor-in-Chief for a scientific journal, The Canadian Entomologist – the ideas presented below may not be transferable to other fields of study). 1. Research concept, framework, and question: The research process leading to a publication has a conceptual backbone – it is the overarching research framework. The background ideas and concepts that initiate the research that leads to a publication come from somewhere (…and someone). Although the end product of research may be the publication, a good research question is at the start, and drives the entire process. Without a solid framework for research, and a clear question, the research will simply never be in a form suitable for publication. The person (or people) who developed the big-picture ideas, research framework, and research question are to be considered as authors on the final publication. In the University framework, this is often an academic who has developed a laboratory and research program around a thematic area of study. 2. Funding. Someone has to pay for research – whether it be a large, collaborative research grant that supports many graduate students, or whether it be a small grant from a local conservation agency. An individual scientist applied for money, and was able to support the research that leads to the publication. These monies could directly support the research (e.g., provide travel funds, purchase of equipment), the individual doing the research (e.g., pays the graduate student stipend, or technician), or the monies could offset the costs associated with the publication process itself (e.g., many journals charge authors to submit their work, also known as page charges). The individual(s) who pay for the research need to be considered as authors on the final publication resulting from the research. More often than not, this individual is the main “supervisor” of a research laboratory, but could also be important collaborators on grant applications, often from other Universities or Institutions. 3. Research design and data collection: Once the overall research question is in place, and funding secured, the actual research must be designed and executed. These are placed together under one heading because it is difficult to separate the two, nor should they be separated. You cannot design a project without attention to how data are collected, nor can you collect data without a clear design. In a typical University environment, Master’s and PhD students are intimately associated with this part of the research equation, and spend a very significant portion of their time in design and data collection mode. Without a doubt, the individual(s) who “design and do” the research must be considered as authors. 4. Data analyses, and manuscript preparation: The next step in the process is taking the data, crunching the numbers, preparing figures and tables, and writing a first draft of the manuscript. This is a very important step in the process, as this is the stage where the research gets transformed into a cohesive form. In a typical University laboratory, this is often done by Master’s students, PhD students, or post-docs, and the product of this stage is often (part of) a graduate student’s thesis. However, it is also quite likely that a research associate, technician, or Honour’s student be involved at this stage, or that this stage is done by multiple individuals. For example, data management and analyses may be done by a research technician whereas the head researcher does the bulk of the synthetic writing. Regardless, one or many individuals may be involved in this stage of the publication process, and all of these people must be considered as authors on the final product. 5. Editing, manuscript submission, and the post-submission process: The aforementioned stage is certainly not the final stage. A great deal of time and effort goes into the editing process, and quite often the editing and re-writing of manuscripts is done by different individuals than those who wrote the first draft. Important collaborators and colleagues may be asked to read and edit the first draft and/or other students within a laboratory may work to fine-tune a manuscript. Most likely, the supervisor of a graduate students invests a lot of time and energy at this stage, and works to get the manuscript in a form that is ready to be submitted to a scientific journal. The submission process itself can also be difficult and daunting – papers must be formatted to fit the style requirements for specific journals, and the on-line submission process can take a long time. After the manuscript has been submitted and reviewed by peers, it will most likely return to authors with requests for revisions. These revisions can be lengthy, difficult, and require significant input (perhaps from many individuals). For all these reasons, this fifth stage of the publication process cannot be undervalued, and the individual(s) associated with editing, submitting and dealing with revisions must be considered as authors. Those five categories help define the main stages that lead to a scientific publication, and there are individuals associated with each stage. Here’s the formula to consider adopting when considering which individuals should be authors on the final product: if an individual contributed significantly to three or more of the above stages, they should be an author on the final paper. Here’s an example: in a ‘typical’ research laboratory, the supervisor likely has a big-picture research question that s/he is working on (Stage 1) and has secured funding to complete that project (Stage 2). A Master’s student, working with this supervisor, will work on the design and collect the data (Stage 3), and as they prepare their thesis, will do the bulk of the data analysis and write the first draft of the paper (Stage 4). In most cases, the editing and manuscript submission process is shared by the supervisor and the student, and both individuals are likely involved with the revisions of the manuscript after it has been peer-reviewed (Stage 5). In this case, both individuals clearly contributed to at least three of five categories, and the paper should be authored by both individuals. A classic example of a paper with a graduate student and supervisor as co-authors. What about the research assistant that helped collect data? – since they only contributed to Stage 3, they are not considered as an author. The same is true of a collaborator at a different University who may have helped secure the funding (Stage 2), but did not help with the process in any other way – they do not qualify as authors on this work. It is quite possible that a post-doc in a laboratory contributes to multiple stages, even on a single Master’s project. For example, the post-doc may have helped secure the funding, assisted significantly with data analysis, and helped to edit the final paper – this entitles them to authorship. This entire method may be considered too rigid, and cannot really be implemented given the complexities of the research process, and given personalities and politics associated with the research process. Furthermore, many researchers may include their friends on publications, in hopes that the favour will be returned so both individuals increase their publication numbers. I do not think this is ethical, and overall, if an individual did not contribute to the research process in a significant way, they should not be authors. The method outlined above provides one way to help determine how this ‘significant way’ can be determined objectively. The process is certainly not without fault, nor will it work in all circumstances, but perhaps it will help to define roles and help to consider seriously who should be considered as authors on papers. I can also admit that I have not always contributed to “3 of 5 stages” on all the paper for which I am an author, so you can call me a hypocrite. That’s OK, (I’ve been called worse), and I reiterate that the process outlined above is context-dependent, and simply provides a framework, or guide, for thinking about this important issue in science. I am certainly not alone in this discussion, nor with this concept – Paul Friedman wrote about this (in A New Standard for Authorship) and the method in analogous to the one outlined above (although with more categories). Some journals also specify their expectations for authorship. As an example, in its instructions to authors, PNAS states that ‘Authorship should be limited to those who have contributed substantially to the work’, and request that contributions be spelled out clearly. This is a good idea, and forces people to think about the issue. I’ll finish with two more important points: First, determining authorship, and thinking about authorship, must be a transparent and clear process. Graduate students must not be surprised when their supervisor states that some other researcher will be an author on their work – this should have been clear from the start. A discussion about authorship must occur early in the research process. Full stop. Second, another key question is the order of authors. For example, when is the student’s name first on a publication, and the supervisor second? What’s the convention for your field of study? Who should be second author when there are four or five co-authors? This is a complicated question and, you guessed it, one that will be addressed in a future blog post! Please share your thoughts… how does your laboratory deal with the question of authorship on scientific papers? This is the very start of what will be an interesting and important project, especially given the concern about the losses of bees, and the economic and ecological consequence of changing pollinator communities. I will continue to post developments in this project. And, I warmly welcome Étienne to the Arthropod Ecology laboratory! While visiting Alaska last week, I had the pleasure of meeting Niels M. Schmidt. He is a community ecologist (from Aarhus University, Denmark), who studies Arctic sytems and he is one of the key people behind the Zackenberg Research Station in Greenland. He told me about one of his recently published papers (authored by Nicolai V. Meyling, Niels M. Schmidt, and Jørgen Eilenberg) titled “Occurrence and diversity of fungal entomopathogens in soils of low and high Arctic Greenland” (published in Polar Biology). By definition (from Wikipedia) entomopathogenic fungi act as parasites of insects – these fungi can kill, or seriously disable insects. I was amazed at this paper because I have never given much thought to fungal entomopathogens in the Arctic (despite knowing their prevalence in other ecosystems). 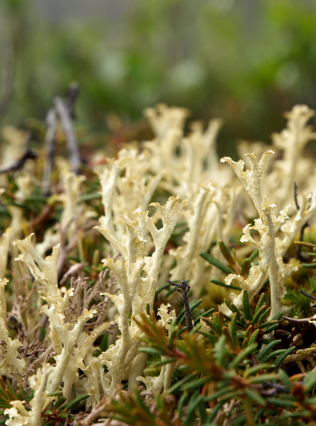 Could these fungi be ecologically important in Arctic? I think Arctic community ecology has been seriously understudied, and we know little about what drives the relative abundance of species. From an arthropod perspective, we know that some birds depend on Arthropods for food (e.g. see Holmes 1966), and that flies are important nuisance pests to large mammals (e.g., Witter et al. 2012), but I would argue that most ecological interactions in the Arctic involving arthropods (and their relative importance) remain a mystery. I could not even speculate on the role of fungal entomopathogens in the Arctic. This is one of those feared ‘black boxes in ecology’: probably there, possibly important, likely complex, but knowledge is seriously lacking. So along comes this paper: Meyling et al. took soil samples from locations in the high and low Arctic (i.e., including Zackenberg, at about 74.5 degrees N), and they returned the samples to their laboratory in Denmark. In their lab, the authors allowed live insects (using Lepidoptera [Pyralidae)] and Coleoptera [Tenebrionidae]) to be exposed to their samples, and they checked regularly for mortality: “...cadavers were rinsed in water, incubated in moist containers and monitored for the emergence of fungi“. Any fungi that emerged from the (dead) host were identified. 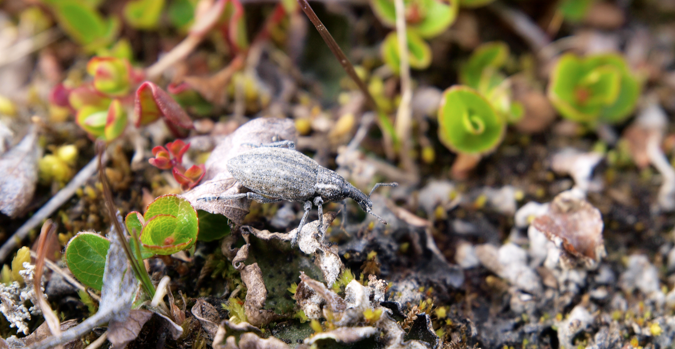 Could this Arctic Weevil die from a fungal infection? The black box has been opened: indeed, fungal entomopathogens are in the high and low Arctic of Greenland, and are therefore likely in the high and low Arctic around the globe. These fungi probably play a role in arthropod mortality in these systems, but this remains completely understudied. As the authors point out, given the tight relationship between fungi and temperature, what effect could a changing climate have on these fungal entomopathogens? This is potentially very important, as increased mortality of insects by fungi could trickle all the way up the food web… I think we need to get more mycologists into the Arctic, and we must work to properly articulate high Arctic food webs with all the black boxes opened wide.